Wild adventures sea kayaking in the Marlborough Sounds, New Zealand. Dayguided trips, overnight safaris and independent hire. Paddling for fun. Based in Picton. The New Zealand Wedding Company specialises in arranging weddings in New Zealand for couples from around the globe. New Zealand wedding venues include Forsyth Island in the Marlborough Sounds and Beach Weddings in Abel Tasman National Park. 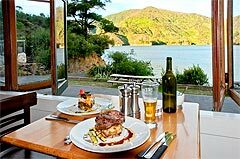 Lochmara Lodge Marlborough Sounds Wildlife Recovery and Arts Centre is set on the tranquil shores of the Queen Charlotte Sound in the Marlborough Sounds of New Zealand. We offer exceptional day tours, cruises and accommodation for visitors looking for unique and memorable kiwi experiences. We provide a destination where national and international visitors can come learn about, interact with and appreciate New Zealand's native flora, fauna and art while enjoying a magical Marlborough Sounds escape. Visit the Marlborough Museum at Brayshaw Park, there is something of interest for everyone in the family. The Museum is open 7 days a week from 10am to 4pm. Lermontov Wreck diving in the Marlborough Sounds New Zealand. New Zealand diver training and marine tourism courses based in the Marlborough Sounds, New Zealand. PADI accredited scuba diving and dive tourism instruction. Tui Nature Reserve is just one of those places you've got to see with your own eyes. Winners of the Marlborough 'Supreme Environment Award' in 2010, this showcase conservation project welcomes you to experience the unique sights and sounds of the lush forest, New Zealand is so famous for. Anyone can turn their dream of flying into reality at the Marlborough Aero Club. We have four professional instructors who are all experienced and qualified pilots. Learning to fly in a club environment is a safe, fun and affordable way to achieve your licence. You can learn at your own pace, enjoy a convenient location close to town, experience Marlborough’s diverse landscape, get support and knowledge from other Club members, and join in with social activities. Sea Kayaking, Mountain Bikes, Jet Skis, Wineries by bike. Guided tours and Freedom rentals available. Relaxed, professional and friendly staff to help you achieve your sense of adventure in and around Marlborough. Small group, guided gourmet walking tours & independent hiking packages from 1-5 days on one of New Zealand’s most spectacular coastal walking tracks with pre-booked accommodation & transport. Photos, trip reports, maps and more. Precision Helicopters Blenheim provide helicopter rides, scenic flights and adventure tours for Blenheim, Picton, Nelson and the surrounding Marlborough areas, including the Sounds. If you don't see the trip you want, just call and we will create it for you. This journey of discovery has been put together by the team at The Molesworth Tour Company to give you a unique tour to New Zealand’s largest cattle station, 180,000 hectares. Enjoy a real experience with local wine, good food and country hospitality.